What Are the Health Benefits of Sangria? 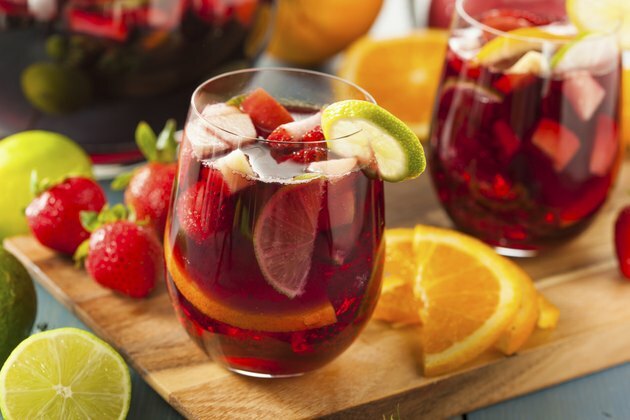 A combination of red wine, fruit juice and fresh fruit, traditional sangria has certain health benefits, as well as a couple of nutritional drawbacks. Of course, the occasional glass of sangria isn't likely to have an impact on your health either way, but it's wise to get all the facts, by using a tool like a calorie counter, before making it your alcoholic beverage of choice. A 5-ounce serving of red wine contains 125 calories and almost 4 grams of carbs. Red wine contributes small amounts of potassium and iron to your sangria. Drinking moderate amounts of alcoholic beverages, including red wine, can slightly boost your levels of high-density lipoprotein, the healthy cholesterol, and may help prevent your platelets from sticking together. The result is a reduction in your risk of heart disease and stroke, according to the American Heart Association. Sangria typically contains some kind of fruit juice, as well as chunks of fresh fruit. One-hundred percent fruit juice adds nutrients to the sangria, but it also increase the calorie count. For example, a 4-ounce serving of orange juice contains 61 calories, but it also adds 42 milligrams of vitamin C, which is more than half of the 75 milligrams women need each day and nearly half of the 90 milligrams men require. Fresh fruit adds fiber, potassium and vitamin A to the sangria, but you only get those benefits if you eat the fruit. If you use fruit-flavored juices rather than 100-percent fruit juice, your sangria will contain added sugar, which increases your risk of unhealthy weight gain. A 4-ounce serving of orange juice drink contains 67 calories and almost 12 grams of sugar, which is equal to almost 3 teaspoons. Most sangria recipes call for table sugar, too, which increases the calorie count even more but doesn't add anything beneficial to the beverage. The benefits of alcoholic beverages only apply when you drink in moderation. That means one 5-ounce portion of wine per day for women and two 5-ounce portions per day for men. More than that can actually raise your risk of health problems. Making your own sangria can improve the nutritional value, too. Use 100 percent fruit juice and don't add any sugar to the drink. Experiment with different kinds of fruit to change the taste of your sangria slightly.